Fancy a whimsical look? You are going to fall head over heels for the Speedo Retro Wings Crossback Girls’ One Piece! This sleek midnight black one piece has a trippy mosaic of multi-coloured birds. In a radiant rainbow print of jewel tones in beautiful shades of ruby, emerald, sapphire, amethyst, and topaz, this look is as beautiful as they come. With an electric tangerine colour panel in back and a marigold Speedo logo at the hip, this one piece is as flashy as they come! 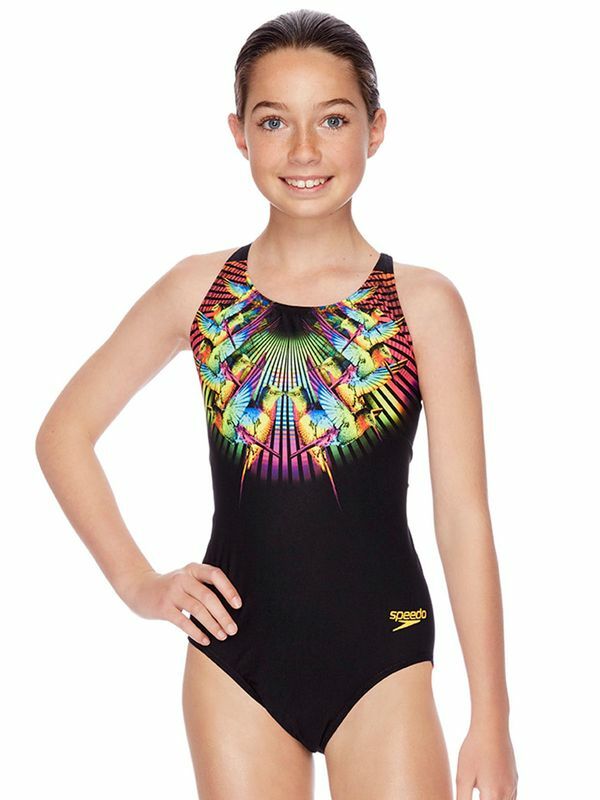 If you are looking for a style as durable as it is beautiful, you are going to love the Speedo Retro Wings Crossback Girls’ One Piece. Retro Wings Cossback Girls One Piece manufactured by Speedo Swimwear the worlds leading swimwear brand. Speedo is passionate about life in and around the water, creating revolutionary new technologies, designs and innovations.